After the end of a rather disappointing spring season where I didn't improve my 10km or my Half Marathon time, I shifted my focus to getting ready for STWM. I have thought a lot about goal setting and the limits that I have put on myself in the past. I wanted to set a big goal, one that I wouldn't necessarily achieve, but that would demand the best of me every day. I set my mind on a 2:25:00 - 3 min 30 sec faster than my time last year. My training didn't really indicate that I was capable of a 2:25:00 but I felt with all of my heart and gut that it was possible. Around the end of July, as I was starting to get into my marathon program, NRC Toronto offered me a bib for the Chicago Marathon. I wanted to say yes immediately, but I knew that I had already set a timeline for STWM and with such a big goal I needed to stay focused. I took a week to think about it. My coach felt it would be best if I didn't do it, I felt it wasn't the logical thing to do but there was this overwhelming feeling telling me to just do it. Sunday, July 23rd after my first M pace workout (done at a 3:30/km 4sec/km slower than 2:25:00 pace) I decided I was all in for Chicago. Just like that, I lost 2 weeks of what could've been valuable training, but as soon as I made my decision I knew it was the right one and I didn't give any second thoughts to the doubts that I had before. As the summer went on, I was running well in my workouts and got a massive 10km PB. My M pace was still 3:30/km but I was still confident that I could hit 2:25:00. Three weeks out from race day my workouts started to lag a little. I was worried that we might have overcooked the cake. I had a steep two-week taper and as the days went by I started to feel better and better. Going into the race, my training partner Kyle and I had slightly different goals. I wanted a 2:25:00 and he wanted a comfortable 2:27:00. We wanted to work together but at the end of the day, neither of us wanted the other to do anything that would compromise their race. I spent all summer trying to catch up to Kyle. He is faster than me in workouts and has faster PB's across the board (except for the marathon). The weeks leading up to the race we talked about what we should split through the half. I wanted 1:12:30 - 1:13:00 and he wanted 13:30:00-1:14:00... I spent weeks convincing him on 1:13:00-1:13:30. I thought 1:13:00 was the absolute slowest I could go if I was going to give my self a serious shot at 2:25:00. So, I did a pace chart with different splits and paces. The day before the race we decided we would try to hit the 10km between 34:40-34:50 (on pace for 1:13:30 half) and from there if we were feeling good we would crank it down and go through the half in 1:13:00. If not, we would separate and I'd go ahead for a 1:12:30 half split. We ended up separating after 5km. I got about 60 meters on Kyle and my first thought was that this marathon just got a lot harder without him. I was relieved when Kyle pulled up by me at 8km. Fom there on he just pushed the pace. We split through the 10km in 34:45 and just kept pushing. We passed the half in 1:12:03. That made me nervous, I was scared that we would pay for this later on. But whenever I had a doubt I just of what Brittany Moran told me before the race "Be Brave". My stomach wasn't feeling well between 15km and 33km. I was afraid to take fluids or fuel but I knew that I had to. I had to keep myself from suggesting that we back off the pace because I knew that as long as Kyle pushed the pace I would be on his side not giving up ground. With about 5km to go I checked in with Kyle to see how he was doing. He was starting to struggle. I told him that at this point it was worth it to push through and that he had worked too hard to let up now. I pulled away and started focusing on people ahead and trying to reel them in. I didn't get to drive the course the day before like I had planned, so I didn't know where the hill was or how much I would have left in the tank when it came. I was careful not to push to hard until after the hill. Chicago is flat... but the one hill it has, is not fun. After I was on the other side I looked at my watch and I just thought.... I am going to do this! It's going to happen! Hitting the 800m mark I thought of how every week I had to do 800m intervals and now all that lied between myself and the finish line was one last 800m interval. As I approached the finish line and saw the numbers ticking on the clock I pushed hard to get under 2:24:00. I finished in 2:23:54 over a minute than what I believed I could do on my very best day. I broke through the highest expectations I had for myself. To add to the excitement, when I turned around I saw Kyle coming down the final stretch! He finished in 2:25:15. I am so proud of Kyle! I believed I could do 2:25:00 and I believe Kyle is faster than me, therefore I believed Kyle could do 2:25:00 as well. It was an amazing run and it feels unreal. But it wasn't luck. It wasn't just our day, it wasn't a bunch of external factors lining up in our favour like a cosmic event. We ran what we ran because it is what we are capable of, because we worked for it and because we believed we could... or at least I believed we could. Now we have to accept that this is where we are at. This is our new baseline. Looking at this cycle I didn't do anything different than my previous cycle. There was nothing special to it. I have identified 5 main things that I changed that had a huge positive effect. 1) Sleep: Last cycle my work hours were pretty hard. I was working on a production that did mostly night shoots so I didn't get a consistent sleep schedule and rarely got enough hours of sleep. It also meant that I'd sleep in the morning when I got home and would have to do workouts between 1pm-3pm in the afternoon heat which took its toll on the quality of my workouts. 2) Training partner: I have had people here and there that I have been able to get the odd workout in with, but I have never had someone that was so well matched to me in terms of fitness and goals. I met Kyle at the end of June at which point he was much faster than me. We have different coaches and different programs but we managed to sync up workouts so that we could get portions of them done together. Having someone else there that expects you to be fast and do your best really makes you rise to the occasion. * Shout out to Brittany Moran, I know we don't train together, but running into you at the expo, calming each other's nerves and pumping up each other's confidence is just the support that teammates give each other. It was nice to have your familiar face with me at the start line and to give each other a thumbs up just before the gun went off. * She also crushed her PB by 5 min and was Top Canadian Female. 3) Mental approach. I put more belief in myself than in data and numbers. I didn't put limits on my potential. 4) Easy days were easy. 5) TIME. The success I had this cycle wasn't the result of the last 3 months of training. It is the result of me putting in consistent work over a long (years) period of time. It takes time for your body to adapt to training and that can't be rushed. So buckle down and be patient. This is the third marathon that I have done where I have followed a training plan and the second cycle that I have been with my coach. There are a lot of runners that I race regularly that I look up to, that have PB's that I aspire to have one day and today I am much closer than I was before. I still need to sit down and give meaningful thought to new goals moving forward, but right now I really do feel unlimited. This cycle didn't take as much of a physical toll on me as it did mentally. My brain is zapped. For the last 3 months, my inner voice had to be louder than any doubts that ever came to mind. When my inner voice wasn't loud enough I had to use my real voice and actually say my affirmations out loud. I had to say things until I believed them.... I felt a little insane... needless to say, I am looking forward to not having a goal burnt into my mind for the next little while, That said I am really excited for what is next. I would encourage anyone reading to set big goals for yourself, ones that you might not necessarily achieve. Not achieving your goal does not mean you failed, you only fail when you give up. Set goals that the person you are today can't achieve and then keep at them until you become the person that can achieve them. Scotiabank is just under two weeks away and there is a good line up of runners ready to get in the low 2:20:00 and some that probably have a good shot at getting under 2:20:00! I can not wait to cheer everyone on and watch. Lastly (grab some wine for the cheese) We all have potential it's just a matter of believing in it, feeding it and then wanting it bad enough. 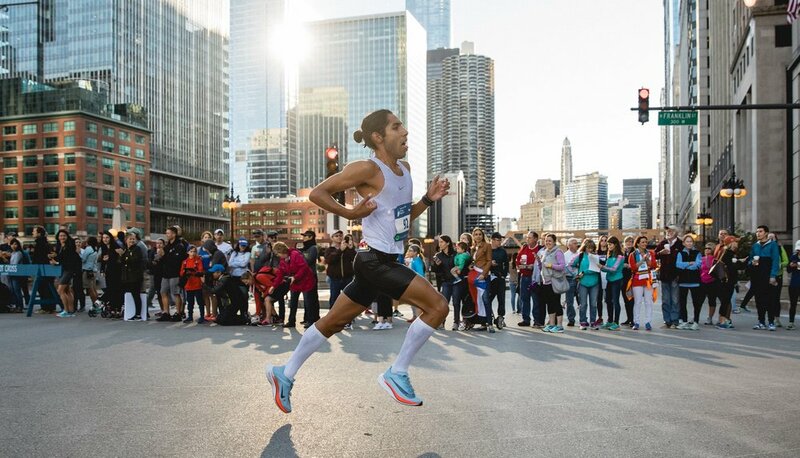 NRC Toronto for giving me the opportunity to take on Chicago and for inspiring me to believe in myself. iRun Magazine for letting me share my journey. To everyone that makes up my running community. Uncle Jamie & Aunt Cathy for being absolutely wonderful hosts for the weekend and making the experience feel like home. Mom, Dad & Jessy for getting excited about a sport you don't understand.